Congratulations, flapjack lovers, today is your day: it’s National Pancake Day, which means restaurants are offering up discounted or free food. But even if flat breakfast fare isn’t your thing, there are plenty of other spots handing out deals and freebies today. IHOP: What, you thought the International House of Pancakes would sleep through this holiest of holy days? Nope. The chain is giving out a free short stack of buttermilk pancakes to everyone and anyone from 7:00 a.m. to 7:00 p.m. today. Guests are encouraged to donate the money they would’ve spent on the meal to the Children’s Miracle Network Hospital. Make a donation of $5 or more and you’ll get a coupon for $5 off your next meal. Waffle House: Wait, waffles? Yes, waffles. Waffle House may be the sworn enemy of pancakes, but that doesn’t mean it isn’t getting in on the action. Customers who use this coupon can get a free order of hash browns through March 8. Denny’s: Save 20% off your check with this printable coupon, good through March 10. Peet’s Coffee & Tea: You’ll have to print out a coupon again here, but with it, you can get half off of any beverage between noon and 5:00 p.m. through March 9. Noah’s New York Bagels/Einstein Bros. Bagels: They’re circular, so bagels are sort of related to pancakes, right? These two chains are owned by the same parent company, and both have coupons for 20% off your purchase. 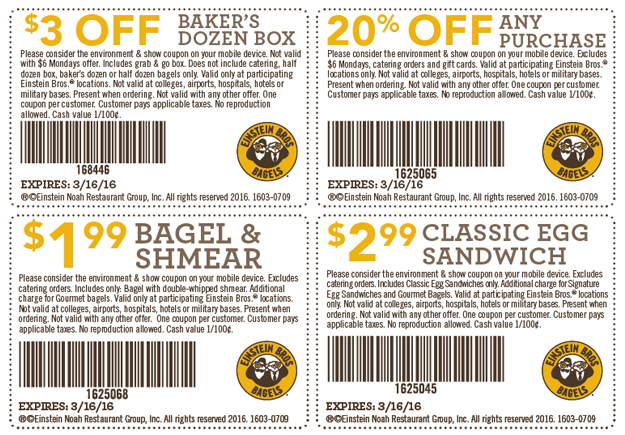 The Noah’s deal expires March 8, but Einstein Bros. is offering the discount until March 16.